Penwith supports eight theatre and amateur dramatic companies and two dance troupes. They perform regularly at venues in Cornwall and beyond. Kneehigh Theatre’s ‘King of Prussia’ has toured nationally to much acclaim and, in the summer of 1996, this innovative company staged ‘Tregeagle’ at the Minack Theatre near Porthcurno. 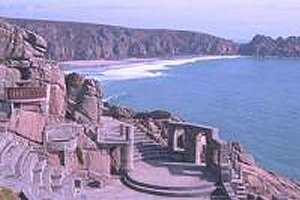 The spectacular open air Minack Theatre has staged over 500 productions since its foundation in 1932 by Miss Rowena Cade. Today there is a seventeen-week summer season. Companies from all over the country vie for one week slots and perform to packed houses. Young people, including parties of students attending language courses in Penzance, make up much of the audience. Cambridge University’s Gilbert and Sullivan Society’s production is a highlight of every season. The open air theatres in Penzance’s Penlee Park and Hayle’s Millpond Gardens are increasingly in use and offer great scope for development while the Acorn Theatre in Penzance has helped to launch a number of local theatre groups and co-hosts the annual puppet festival. Its varied and lively programme of theatre, music and poetry make it a popular venue, especially with young people.